The original bodybuilding, powerlifting and weightlifting wiki. » Strength Training Articles » Training For Platz-like Legs! 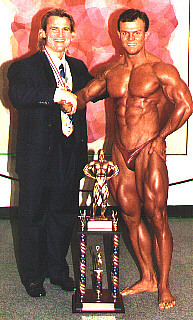 I got to meet the godfather of legs, Tom Platz, at the 1995 AAU Mr. America Tom has always been a bodybuilding hero of mine. He had great legs when everyone else was just trying to get the "V" split down the front of their thighs. I usually do 3 exercises for quads and 2 for hamstrings. Each exercise consists of 3 to 4 sets. Making for a total of 9-11 sets for quads and 7-8 sets for hamstrings. I usually perform one of the two workouts: Workout 1: Squats, Hack squats, Leg Extensions, Stiff-legged Deadlifts, Lying Hamstring Curls. Workout 2: Leg Press, Barbell Lunges, Leg Extensions, Lying Leg Curls, Standing Leg Curls. After completing one of these two workouts, I finish with 4 sets of Calf Presses on the leg press machine. Squats: I train for power in the off-season. I have squatted 500lbs. for nine reps all the way down. I love squatting. I don't believe in squatting less than parallel unless you have an injury. I just don't feel you can thoroughly work the legs by barely going down. I know you can handle more weight, but who cares? You won't get the leg development and if you ever powerlift, your lifts won't count! I will wrap my knees when I get above 405 lbs. Since this is a free weight exercise, I like to keep the knees as stable as possible. My rep scheme is usually 10, 10, (1st two are warm ups) 10, 8, 8, 10. I go heavier each set until the last one where I come back down. Sometimes, when I'm burnt out on heavy weights and my strength gains have come to a halt, I'll get on a kick where I'll do high reps every squat workout. During these phases I try to keep the reps between 15 - 20 for all four working sets. Leg Press: Another major mass builder here. I love leg pressing almost as much as squatting. I always do my reps slow and controlled. I try to stay in the 10-15 rep range for most of my sets. I absolutely never wrap for leg presses! I can't believe anyone does. There is no benefit to wrapping other than you can lift more weight. This is not a free weight exercise, the risk is very limited. Most of the guys I see wrapping on the leg press are also the same people who move the seat all the way forward. It's like they are intentionally trying to limit leg growth! Really what they are trying to do is impress everyone in the gym with how much weight they are lifting. I did this one time when I was younger. I wrapped because I had to much weight on the leg press and I couldn't have even moved it without the wraps. I thought everyone would be so impressed when I finished my set. After grunting out a few reps, I racked the weight. Guess what? No one was even looking or cared! My legs got no burn or pump from the set. It was a complete waist of time. I vowed then to never again waste my time wrapping for a set of leg presses. Barbell Lunges: I do these with an Olympic bar placed across my back like I'm getting ready to squat. I then lunge forward with one leg and bend down until my back leg's knee hits the ground. Pushing back with the front leg, I return to a leg spread upright position. I then go back down with the same leg forward for another rep. I continue this until I have completed 10-12 reps for the leg before switching to the other leg. Lunges seem to really help develop thigh separation and detail. They hit the all-important sartorius muscle which runs like a band on the inside of the quadriceps. Stiff-legged Deadlfits: I perform these on a block so I can get a full stretch at the bottom. The edges of the 45 lb. plates clear the edges of the block so I can touch the bar to the top of my feet. I keep my legs fully locked sometimes, and slightly bent on others. I like the variety. I always try to concentrate on pulling the bar up with my hamstrings. Think of your lower back as just the swivel point. On the way up don't go all the way. Stop when the bar reaches mid-thigh and then start descending again. This will keep constant tension on your hamstrings. I keep reps in the 10-12 range for this exercise. I don't really have anything special for the other exercises. I just use slow controlled form and always strive to feel the muscle.